What the Jim Baen Memorial Short Story Award looks like. Matt McHugh of New Jersey has won the grand prize in the 2019 Jim Baen Memorial Award competition for his short story “Burners.” The Jim Baen Memorial Short Story Contest has been held annually since 2007 and is focused on stories of space exploration and discovery, with an optimistic spin on those activities for the human race. 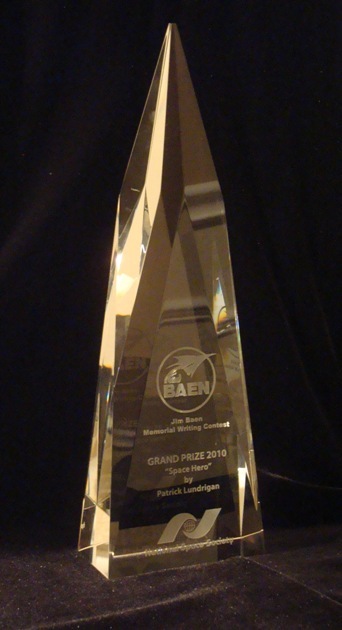 Judges for the award were the editors of Baen Books. Stories were judged anonymously. The Jim Baen Memorial Award will be presented June 8, 2019 in a ceremony at the annual International Space Development Conference held this year in Arlington, VA. The winner receives a distinctive award and professional publication of the story in June 2019 at the Baen.com web site. The contest occurs annually and looks for stories that demonstrate the positive aspects of space exploration and discovery. This entry was posted in Awards and tagged Baen Books, Jim Baen Memorial Short Story Contest by Mike Glyer. Bookmark the permalink.